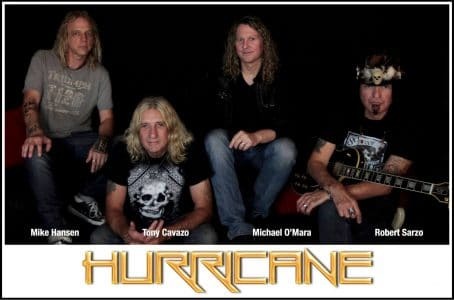 ’80s hair metal rockers Hurricane are back with a new line-up consisting of founding members Robert Sarzo (guitar) and Tony Cavazo (bass) along with drummer Mike Hansen (since 2010) and new singer Michael O’Mara (since 2016). Hurricane have released four albums consisting of the Take What You Want EP (1985), Over The Edge (1988), Slave To The Thrill (1990) and Liquifury (2001). They are best known for their top 40 single “I’m On To You” stemming from their Over The Edge album. Hurricane‘s original singer Kelly Hansen became the lead vocalist for Foreigner in 2005 and according to Wikipedia, Hurricane reformed in 2010 with Sarzo, Cavazo and Mike Hansen along with singer Andrew Freeman (Lynch Mob, Last In Line) in 2010. Freeman lasted until 2012 and was replaced by singer Jason Ames from 2014 to 2015. The new Hurricane line-up has announced “New Line Up! New Songs! New Recordings! New Shows!…” on its Facebook page as of May 29, 2016. Hurricane have the distinct or dubious honour of having one of fifteen album covers featured in Sleaze Roxx’s Censored section. The group’s third album Slave To The Thrill, which was released in 199o, has both censored and uncensored covers.